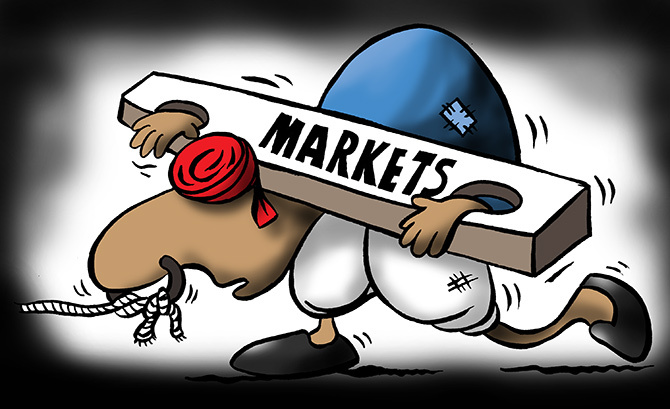 Benchmark indices Sensex and Nifty fell for the fourth session in a row to hit their over six-month low levels, dragged by IT and pharma stocks as concerns over rupee fall, global trade war tiff and geo-political tensions resurfaced. The BSE index ended 287.15 points lower at 33,847.23 -- the weakest closing since April 10, when the 30-share gauge had settled at 33,880.25. Similarly, the NSE Nifty dropped 98.45 points to end at 10,146.80 -- its lowest closing since April 4. "Profit booking in IT & Pharmaceuticals stocks dragged the indices lower today. “These two sectors were holding their ground recently while overall markets corrected. “Investors choose to book some profits here as the tailwinds of depreciating currency are slowing," said VK Sharma, Head PCG & Capital Markets Group, HDFC Securities. The 30-share index closed down 287.15 points or 0.84 per cent at 33,847.23 after hitting a low of 33,742.75. This is the weakest closing since April 10 last, when it settled at 33,880.25. The index had lost 1,028 points in the previous three sessions. The broader NSE Nifty too fell below the 10,200 level by dropping 98.45 points, or 0.96 per cent, to end at 10,146.80. Intra-day, it touched a low of 10,102.35. However, short-covering by speculators towards the fag-end helped both the key indices to trim losses. "In yet another volatile trading session, the Indian equity benchmark indices ended lower for fourth straight session, driven largely by weak global cues... Barring Power & Realty which ended marginally higher, all the other sectoral indices ended in the red with IT, Healthcare & FMCG being the top losers, down 1.2-2.8 per cent. Globally, the Asian & European indices traded sharply lower," experts said. Asian Paint was among worst performer in the Sensex pack, falling 5.21 per cent, followed by Sun Pharma at 5.07 per cent after the company reported a 14.76 per cent fall in its consolidated net profit to Rs 506 crore for the September quarter on Monday. Bucking the trend, IndusInd Bank, PowerGrid, HDFC Ltd, Yes Bank, Bajaj Auto, Kotak Bank, Adani Ports, Coal India, Axis Bank, Tata Steel and NTPC were top performers in the Sensex kitty, rising up to 2.62 per cent and cushioned the fall. Among sectoral indices, the BSE IT index suffered the most by falling 2.79 per cent, followed by teck (2.48 per cent, healthcare (2.34 per cent), FMCG (1.18 per cent), auto (0.73 per cent), capital goods (0.69 per cent), metal (0.69 per cent), oil & gas (0.33 per cent) and infrastructure (0.33 per cent). However, realty and power indices ended higher by up to 0.41 per cent. The broader markets followed suit with the small-cap index falling by 1.14 per cent, while mid-cap index lost 0.76 per cent. In the Asian region, Hong Kong's Hang Seng slumped 3.22 per cent, Japan's Nikkei dropped 2.67 per cent, while Shanghai Composite Index declined by 2.26 per cent. Taiwan too fell 26 per cent and South Korea down 2.57 per cents. In the Eurozone, Frankfurt's DAX was lower by 2.18 per cent, while Paris CAC 40 fell 1.43 per cent in their early deals. London's FTSE too was down 0.93 per cent.